For years now I have tried modelling the cobwebs that appear majestically on anything in real life, that is left under shelter, or a tree. I am not too sure, either, of the real colour of DB cobwebs, as they would have been in era III. I have tried stringing glue from a tube, unravelled cotton, introduced various species of web-spinning creatures to my layout room, but so far have not been satisfied with the results. Anyway, today, mysteriously, I have discovered that some creature has done the job for me. I hope that it is the right colour. 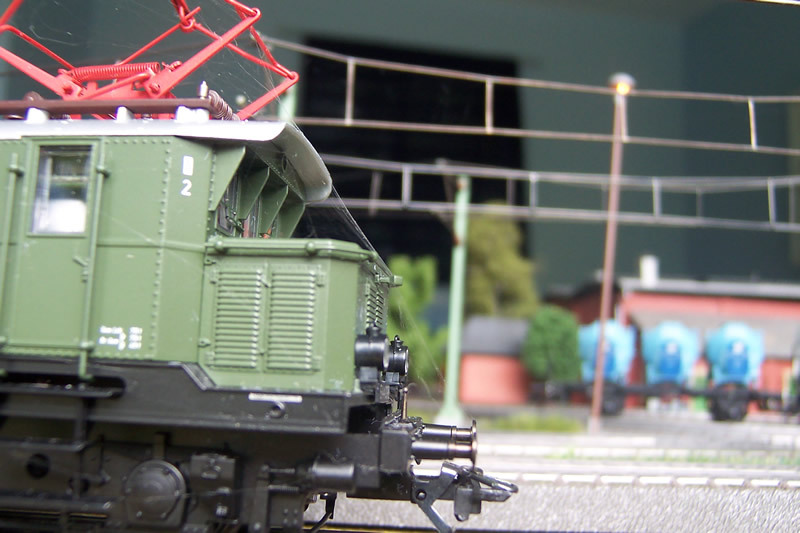 The engine was left after a turn of duty, with its nose sticking out of the shed. Now there is a beautiful web, from top of pantograph down to the buffers. The driver has driven it out of the shed, and has not bothered to get rid of the web. I suppose the speed of his soon to be picked up train will simply tear it off. In the second photo, I note that the driver has got his wurst sausage for lunch, up against the windscreen, no doubt the cold outside will keep it fresh in that spot.